Gaon of Pumbedita from 719 to 730; son-in-law of the exilarch Ḥasdai I. Vain of his family connections and secure in his position, he was so arrogant in his dealings with the students that many of them left the academy, returning only after his death (Letter of Sherira Gaon). Two responsa are ascribed to him, both relating to the return of Jews who had left their community to follow heretical leaders ("Sha'are Ẓedeḳ," iii. 7, 10). In one of these responsa Naṭronai decides that the followers of the pseudo-Messiah Serenus, should again be received into their community; in the other he decides against the reception of the children of certain heretic Jews who had renounced both the Talmudic and the Biblical Judaism. Weiss, however, ascribes these two responsa to Naṭronai b. Hilai. A number of responsa in the compilation "Sha'are Ẓedeḳ" and else where (comp. Mussafia, "Teshubot ha-Ge'onim," Nos. 23, 52, 63, 83-87, 90, Lyck. 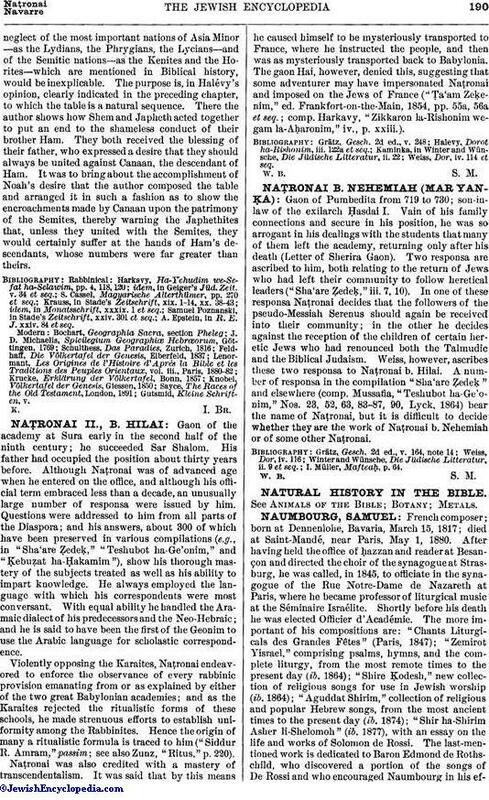 1864) bear the name of Naṭronai, but it is difficult to decide whether they are the work of Naṭronai b. Nehemiah or of some other Naṭronai. I. Müller, Mafteaḥ, p. 64.